Here’s Prince William and Kate Middleton proving they are a sweet couple – after two bakers recreated them as a CAKE TOPPER. 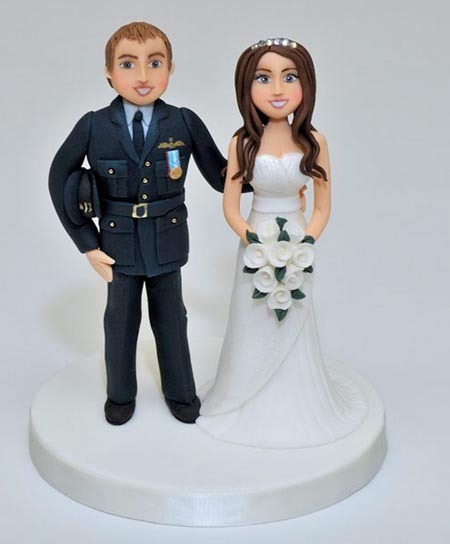 The figures, standing six-and-a-half inches high, are made out of marzipan and sugarpaste and show the beaming couple dressed in their wedding outfits. William is dressed in his Royal blue RAF suit while his stunning bride is dressed in a flowing white strapless gown complete with bouquet. 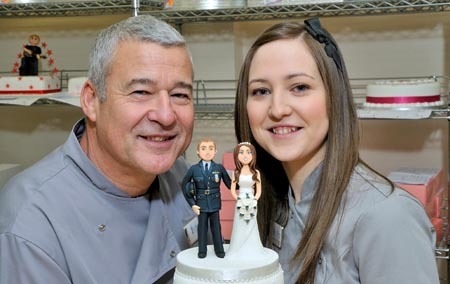 Baking giant Renshaw, who hold the Royal warrant for nut produce, commissioned award-winning cake makers Terry Tang, 51, and his daughter Leanne, 23, to make the figures as a wedding gift for the couple. The pair took three days and studied hundreds of pictures of the couple to make the edible figures look as realistic as possible. Former stone mason Terry said: ”We were thrilled when Renshaw asked us to create the topper. ”It’s the first request we’ve had for real life figures and so it was a challenge.